The Cruces de Mayo or May Crosses tradition of decorating crosses with flowers can be found in many places throughout the world. 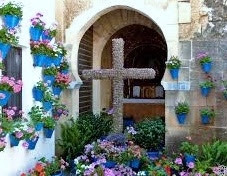 The crosses, which can be up to 3 metres high, are decorated with, traditionally, red or white flowers and/or plants in pots. Every year the day or two around the Sunday nearest to May 1st, crosses can be found in many towns around Andalucia but Cordoba is the most famous. It begins the month of May or the month of flowers and is closely followed by the Fiesta of Patios and Fiesta of Balconies and Railings. Everything starts for a reason and the Cruces de Mayo tradition or legend says that St. Helen is the founder of this particular one. In the fourth century AD her son St Constantine had a dream that a cross would help him win the battle they were in. His troops built a huge cross and carried it into the battle, which they won. The outcome of the victory saw Constantine's family converting to Christianity and Saint Helen went to Jerusalem to find Jesus' cross. When she found three crosses she decided to find out which was the cross of Jesus by seeing which one could perform miracles. One did. It healed the sick and brought the dead back to life. St Helen became a champion for the cross which is why we celebrate them today. In Cordoba many crosses can be found in nooks and crannies across the city. This age-old custom, became a competition in 1953 rather like the Cordoba patios. 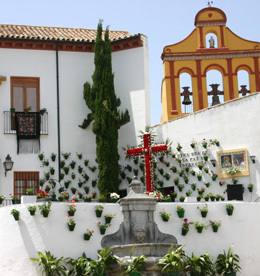 In the May Crosses Festival local associations decorate crosses and set up their cross in their area along with a bar serving drinks and tapas, a necessity if it's hot and you're walking around to see the find the different crosses. The first prize winner this year will receive 1,200 euros, a nice incentive to get decorating. 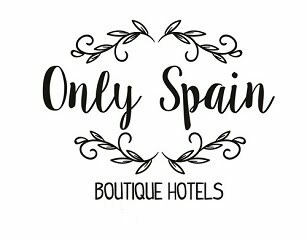 This is Spain so of course there is loud music and it's an occasion so out come the flamenco dresses and you'll probably see impromptu dancing in the streets. In the evenings there are live performances by dance academies in Plaza de las Tendillas and at 12.30pm on Saturday a street procession from Bulevar Gran Capitan involving all the dance academies and flower-filled floats. A joint Seviallnaperformance takes place in Plaza de las Tendillas when they arrive there - a lively, noisy and fun affair. This year the four-day May Crosses Festival is 27th April to 1st May. To see most of the display wander around the districts of San Basilio, San Andres, Santa Marina and San Agustin. 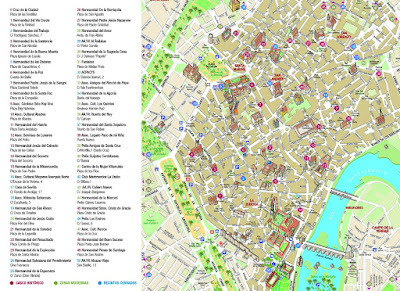 Here's a map of where to find the crosses throughout Cordoba. Good hunting, have fun and maybe I'll see you there!